This release provides bug fixes and improves detection of the A-axis limit sensor for the DWX-4 dry mill. This document should be used as the guideline for replacing the collet for the DWX-4, DWX-50, and DWX-51D. *****The collet should never be removed unless replacement is necessary****Please see "Collet Maintenance" for tightening instructions. This manula will assist users in the setup and operation of the BOFA DustPRO Base unit for the DWX Dental Mills. Este documento explica cómo configurar el equipo y cómo instalar el software suministrado. Léalo en primer lugar. This setup guide will walk users through the installation and setup steps for proper installation of the DWX-4. DWX-4 EasyShapeCAM update supports milling Hybrid Abutments, Roland’s specially coated ZDB-HY tools(used for VITA Enamic and LAVA Ultimate), and the 0.3mm tool for milling fine anatomic detail. Multi-core processing is also enabled for faster processing. Latest version of VPanel software for the DWX-4. Updates the brand name to DGSHAPE. Get the most value out of your dental milling tools. We take a look at the most popular dental tools being used with Roland Dental Milling devices. The air regulator for the DWX-50 and DWX-4 has a filter located within the clear plastic bottom cup. This filter can sometimes be discolored and become yellow or brown in color. 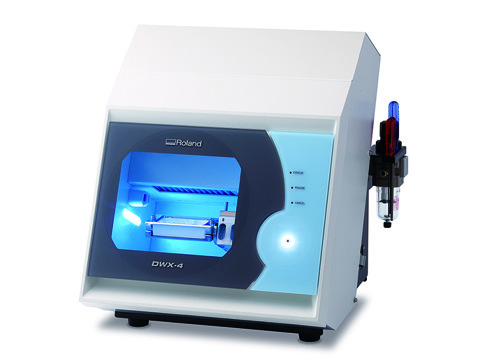 ​What are the approved milling materials for the DWX-4? What are the recommended load sizes? ​​The air nozzle is not clearing away the cutting dust during the milling process. ​What should I do when the regulator drain bowl contains fluid or appears contaminated?